Mauro Santambrogio (Vini Fantini) emerged from the mist to win Saturday’s weather-affected stage 14 of the Giro d’Italia, ahead of Vincenzo Nibali (Astana) who extends his lead in the general classification. The race leader put over 30 seconds into his main rival Cadel Evans (BMC Racing), although he opted not to contest the sprint for the finish-line bonus time, allowing his compatriot Santambrogio to take Vini Fantini-Selle Italia’s first stage win of this year’s race. The route was significantly altered, with the Sestriere ascent that was supposed to be tackled before the Jafferau being removed due to the risk posed by the treacherous conditions. On the Jafferau, however, the race burst into life, with Sky setting the pace before attacking with Sergio Henao, who was joined by Italians Diego Rosa (Androni) and Franco Pellizotti (Androni). 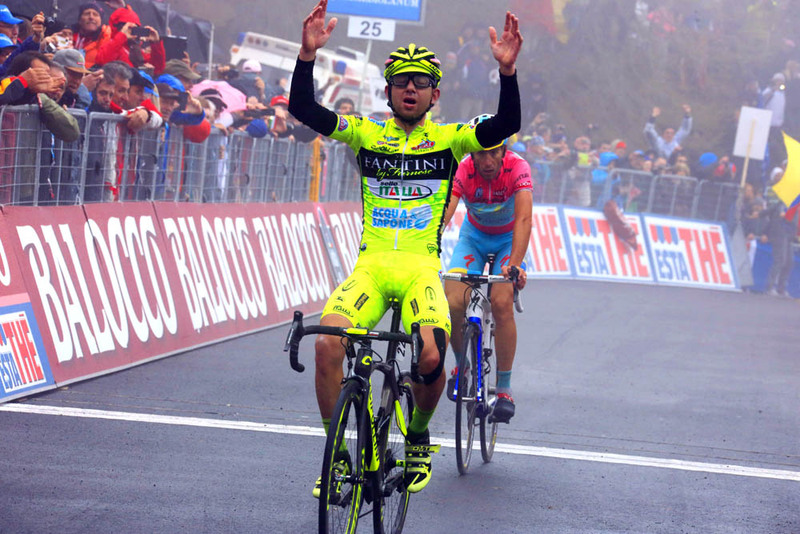 Their attack however was negated when Nibali made his move, of which only a select few could follow. In the final kilometre the selection reduced to just him and Santamborgio, with Carlos Betancur (Ag2r) just missing out again in third at 9 seconds down, and Samuel Sanchez (Euskaltel-Euskadi) finding his climbing legs with fourth at 26 seconds. Most importantly for Nibali, his two main rivals Evans and Rigoberto Uran (Sky) finished half a minute down, which puts the Sicilian in an even stronger position in the GC. The break of the day consisted of Matteo Trentin (Omega Pharma), Daniele Pietropolli (Lampre-Merida), Sonny Colbrelli (Bardiani Valvole) and Luca Paolini (Katusha), and the latter two were only caught in the final kilometre. Paolini had managed to drop Colbrelli and retain a reasonable lead over the pink jersey group, but with Nibali’s attack and the extremity of the slopes at the very top of the climb was unable to hold on and take a remarkable second stage win. 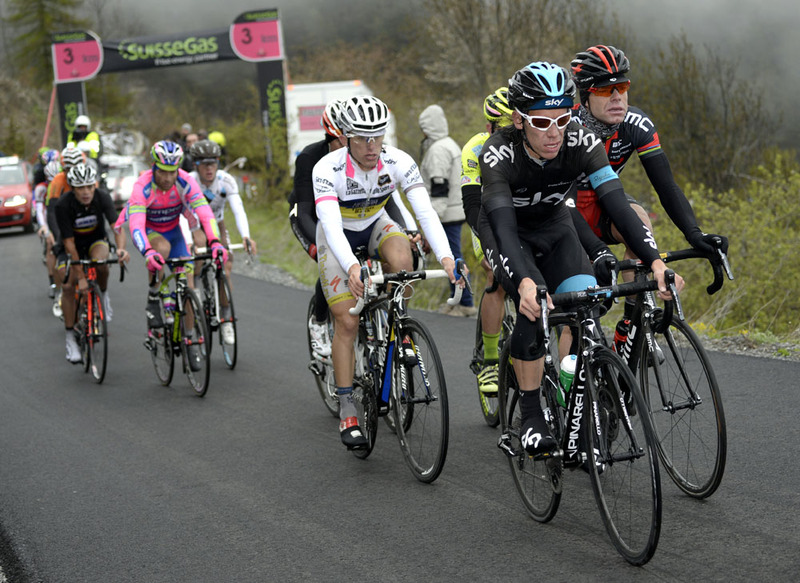 Today’s big loser was Robert Gesink (Blanco), who came in four and a half minutes down and slips out of the top ten. Michele Scarponi (Lampre-Merida) will also be disappointed with the minute and a half he lost, and it is beginning to look as if only three riders are capable of dethroning Nibali: Evans, who comfortably remains in second; Uran, who is still climbing well following his victory on the Montasio; and Santambrogio, the only rider Nibali has not yet distanced in the mountains. Ag2r and Lampre do, however, have two cards each to play, with Scarponi, Przemyslaw Niemiec (Lampre-Merida), Domenico Pozzovivo (Ag2r) and Betancur all within six minutes, and could therefore pose some headaches with ambitious attacks. 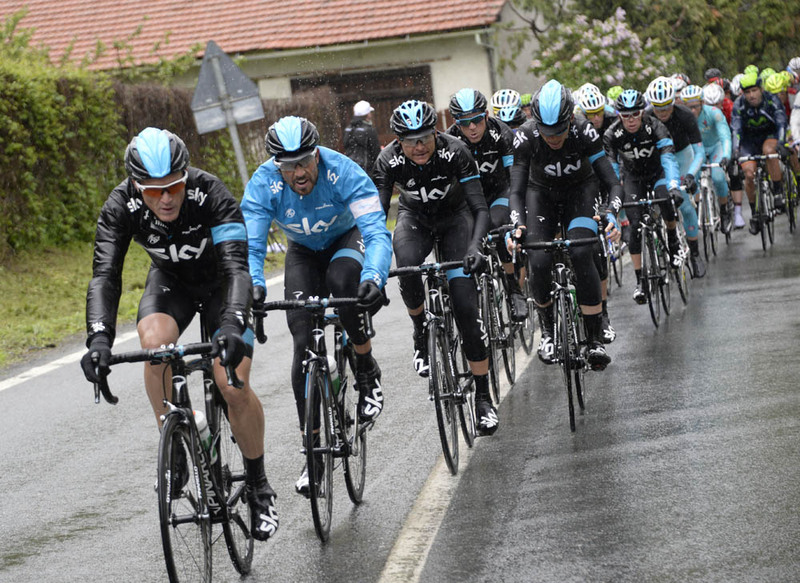 The weather proved a hazard all day, with rain causing a very difficult day in the saddle for all the peloton. Stage four winner Enrico Battaglin (Bardiani Valvole) and Alessandro Vanotti (Astana) suffered the most and were both forced to retire, with the former breaking a rib and the latter fracturing a collarbone in a crash, while Britain’s David Millar (Garmin-Sharp) was also forced to retire.